Manchester City have cut Manchester United’s ticket allocation for the next upcoming derby on November 10th, as punishment for United fans failing to comply with various safety standards during last season’s corresponding fixture at Eastlands. City have announced that they will withhold 10% of the 2,846 tickets that they usually allocate (and cordon off the first two rows of seating), after receiving complaints of ‘persistent standing’ in the away enclosure when United beat them 1-0 in the Premier League back in April. These measures are hardly a new concept to United’s travelling fans, who have already seen their allocations at Sunderland and Bolton reduced due to similar trivial offences. to be fair at the end of last year’s manchester derby, when man united scored, you could see 3 or 4 rows of their supporters fell down towards the bottom of the section – so they are dangerous. That’s ridiculous. If you’ve ever been in the Stretford end, you’ll know that a hell of a lot of people can stand through a football match without any trouble happening. City are just finding petty ways to fulfill their obsession with trying to get one over on United. @Tinez – to be fair, maybe wastelands isn’t safe enough and has nothing to do with united fans. 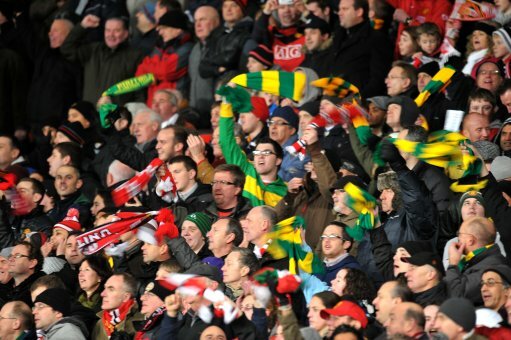 United do have long standing problems at their own ground with Trafford Council threatening them unless their fans sat down! The Independent, 10 March 2001.
did any of you see how many City fans were standing up in the game against Blackpool? i.e. pretty much all of them? Lol. Is this for real? I read the headline and expected a joke. How can you enjoy a game sitting down? AREN´T YOU SUPPOSED TO BE REAL FANS IN ENGLAND? ?